TAMPA BAY, Florida – 10Investigates has investigated dozens of cases involving aggressive towing, and it has exposed countless violations of state and local laws. While one size does not fit all complaints, there are resources in most Tampa-area counties to file towing complaints, in hopes of getting potential refunds. In Florida, private property owners have the right to contract with a wrecker service to remove vehicles on its property for any circumstance. However, Florida State Statute 715.07 requires certain signage at the property, as well as certain procedures for the tow truck to follow. Violations may be misdemeanors or felonies. Additionally, each county sets its own maximum charges for nonconsensual towing. 10Investigates has put together this guide to help you determine if you've been ripped off - and if you have, how to file a complaint for a potential refund. First, read this guide on what to do after you're towed. If neither the private property owner nor towing company is willing to take responsibility for a violation, you can either take them to small claims court (for violations of private contracts) or file a complaint with a government/law enforcement agency (for violations of state/local laws). If your local law enforcement agency says it doesn't handle towing complaints, make sure to cite a specific violation in Florida State Statute 715.07 to convince the agency to take your report. Hillsborough County - Since the state disbanded the Public Transportation Commission, wrecker complaints are now handled by Hillsborough County Consumer Protection, unless it is a violation of FSS 715.07, in which case the Hillsborough County Sheriff's Office and/or Tampa Police Department have jurisdiction. Pinellas County - The county's Consumer Protection department has issued a handful of warnings and citations in recent years, as well as negotiating more than a dozen refunds to drivers. Recent changes to county ordinances, sparked by 10Investigates stories, added even more consumer protections. Those took effect on October 1. For criminal complaints, the Pinellas County Sheriff’s Office can also investigate unlawful tow truck operations. Polk County - Local agencies, including the Polk County Sheriff’s Office, appear to be the best resource for overcharging and other violations. 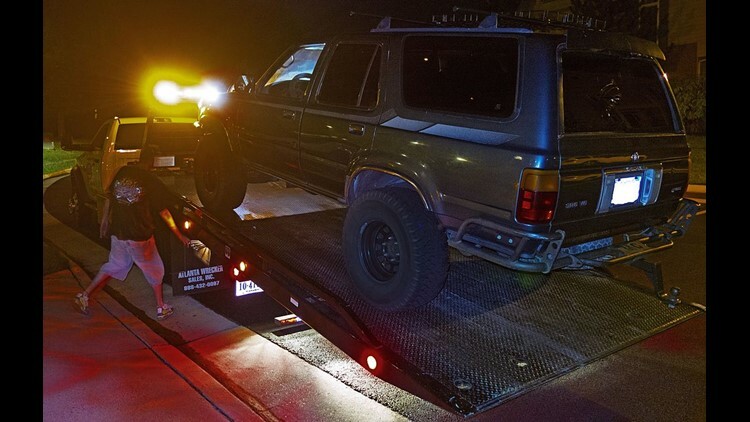 PCSO recently arrested a pair of tow truck owners for violations of local and state rules, and they have warned other companies about violations as well. Pasco County - The county's code compliance department has investigated complaints about tow truck problems, but could not find any action taken against wreckers. However, 10Investigates has exposed violations of the state laws and county ordinances in Pasco County and has encouraged the code compliance department - as well as the county's sheriff's office - to be on the lookout for more. Manatee County - The sheriff's office has opened new towing investigations after 10Investigates brought problems to its attention. It is seeking victims of any towing-related crimes and you can contact them here. Sarasota County - 10Investigates couldn't find any towing citations or arrests from either the Sarasota Police Department or the sheriff's office, but you should bring any reports of violations to the appropriate law enforcement agency. Citing a specific violation will help. Hernando County - 10Investigates couldn't find any towing citations or arrests from the Hernando County Sheriff's Office, but you should bring any reports of violations to them. Citing a specific violation will help. How much can a tow truck charge in Tampa Bay? Hillsborough County – New county regulations limit wreckers to charge $125 for a tow, plus $5 for every mile transported. The state prohibits wreckers from towing vehicles more than 10 miles in a county the size of Hillsborough. Fees for "special equipment” were banned in December 2017 in Hillsborough County. An $80/hr charge, billed in 15-minute increments, may be added for excessive labor that requires more than 30 minutes of work. A $75 administrative charge may be added if certified letters have been mailed to the vehicle and lien owners regarding possible liens placed on the vehicle. If the vehicle’s owner takes more than three hours to claim his or her vehicle, a $50 gate fee is allowed on Sundays, as well as Mondays through Saturdays between the hours of 6 p.m. and 8 a.m. Storage fees for tows after Dec. 6 are prohibited within the first 6 hours, then $25 per day afterward. Pinellas County - The county ordered a review of its rates in 2016, but currently, county ordinance 122-42 limits wreckers to charge $100 for a tow, plus $3 for every mile transported. The state prohibits wreckers from towing vehicles more than 10 miles in a county the size of Pinellas. And the county prohibits any “special equipment” or “after-hours” gate fees. It also now requires wrecker companies to accept credit and debit card payments. A $30/hr charge may be added for excessive labor that requires more than 30 minutes of work. A $20 storage fee may be charged per day after the first 6 hours, and a one-time $30 administrative fee may be charged after the first 30 hours. Polk County - County ordinances 08-065 and 13-059 limits wreckers to charge $100 for a tow, plus $4 for every mile transported. The state prohibits wreckers from towing vehicles more than 10 miles in a county the size of Polk, unless there isn’t a towing facility within 10 miles. The county allows a one-time $45 “administrative” fee once a vehicle is placed in storage, and a $35 “extra preparation” fee if the drive shaft, linkage, or drive shaft needs to be adjusted to protect the impounded vehicle. Between 6 p.m. and 8 a.m. – and all day on Sundays – the facility may charge a $50 “non-business hour” fee. After 6 hours, the facility may also charge a $20/day storage fee. Pasco County - The maximum fees are subject to increase a small amount, based on the Consumer Price Index (CPI). But currently, county resolution 07-169 limits wreckers to charge $105 for a tow, plus $3 for every mile transported. The state prohibits wreckers from towing vehicles more than 15 miles in a county the size of Pasco, unless there is no towing facility within 15 miles. A $25 inside storage fee - or $20 outside storage fee - may be charged per day after the first 6 hours, and a one-time $35 administrative fee may be charged after the first 30 hours. The county also allows a one-time $35 after-hours charge for vehicles picked up between 6 p.m. and 8 a.m. if – and only if – no authorized employee was on-premises at the time of the pickup request. A $90/hr charge may be added for excessive labor that requires more than 30 minutes of work. Sarasota County - County ordinance 122-71 and resolutions 2008-176 and 2007-089 limit wreckers to charge $125 for a tow, plus $4 for every mile transported, up to 12 miles. A $100/hr charge may be added for excessive labor that requires more than 30 minutes of work. A $25 "dolly" fee may be charged if necessary. A $25 outdoor storage fee - or a $35 inside storage fee - may be charged per day after the first 6 hours, and $40 administrative fees may be charged after the first 24 hours of storage, and a second time after the next 24 hours of storage. Between 6 p.m. and 8 a.m. – and any day the facility is closed – the wrecker company may charge a $50 “after hour gate fee." Manatee County - County code sec. 2-19-71 limits wreckers to charge $125 for a tow, plus $4 for every mile transported. The state prohibits wreckers from towing vehicles more than 15 miles in a county the size of Manatee, unless there is no towing facility within 15 miles. A $100/hr charge may be added for excessive labor that requires more than 30 minutes of work. A $15 fee may be added if the drive shaft, linkage, or drive shaft needs to be prepared to protect the impounded vehicle. A $35 "after-hours" fee may be charged before 8 a.m., after 6 p.m., or anytime on Sundays. A $25/day storage fee and one-time $45 administrative fee may be charged if the vehicle is not retrieved within six hours. Hernando County - HCSO tells 10Investigates its rates mirror the Florida Highway Patrol's rates, which are $125 for a base tow, plus $3 for every mile transported beyond a 10-mile radius. The state prohibits wreckers from towing vehicles more than 15 miles in a county the size of Hernando, unless there is no towing facility within 15 miles. A $75/hr charge may be added for excessive labor that requires more than 30 minutes of work. A $30 outdoor storage fee - or a $35 inside storage fee - may be charged per day after the first 6 hours, and one-time $35 administrative fees may be charged after the first 24 hours. Citrus County - County code 98-2 limits wreckers to charge $100 for a tow, plus $3 for every mile transported. The state prohibits wreckers from towing vehicles more than 15 miles in a county the size of Citrus, unless there is no towing facility within 15 miles. An $80/hr charge may be added for excessive labor that requires more than 30 minutes of work. A $35 administrative fee and $20/day storage may be charged if the vehicle is not immediately retrieved.